A Christmas experience far from the high street. 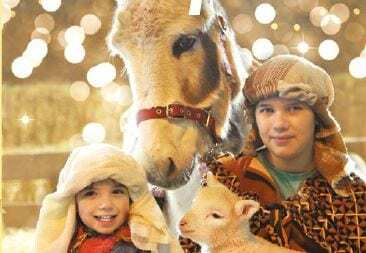 Join the cast for a magical family nativity experience, everyone will be in the Christmas spirit with a visit to Santa and festive treats in the café. The whole family is caught up in the Christmas magic at Pennywell. Adults are welcome to take part in the Nativity or simply watch the delight and wonder on the children’s faces from the cosy straw bale seating, as the greatest story ever told comes to life. Picture the scene . . a magical manger setting with all the Pennywell animals, the barn twinkling with hundreds of tint lights in the many Christmas trees and carols ringing out across the farm. Every child can become a star performer of they would like to. We have the costumes to provide a host of heavenly angels, shepherds watching their sheep, wise men travelling to worship, innkeepers and of course, Mary and Joseph. The Christmas Journey continues as every child will be greeted personally by Father Christmas to receive their very special Christmas gift. A warm festive welcome then awaits in Henny Penny’s Cafe where the smell of mulled wine and delicious mince pies fill the air. Sit back and enjoy a tea or coffee while the children are treated to a homemade Christmas biscuit and a soft drink. You need to allow two hours for your Pennywell Christmas experience, beginning with your Nativity performance to get you into the Christmas spirit, followed by a visit to Father Christmas and rounded off with festive refreshments. Booking is essential see www.pennywellfarm.co.uk for the full range dates and times available.